Murray Rothbard wrote many great academic works such as Man, Economy, & State with Power & Market and An Austrian Perspective on the History of Economic Thought. Both of these works are terrific, but I must say that I thoroughly enjoyed reading Rothbard in such an open and relaxed form; private letters sent to his benefactors at the Volker Fund. While the majority of these letters were book reviews, Rothbard still provided great insight into their topics. It is also interesting to see Rothbard's views towards the beginning of their evolution. We all know that he coined the term "Anarcho-capitalist" that I proudly use to describe my political views. In the memo "Are Libertarians Anarchists" [which is one of my favorites from the book], Rothbard points out that libertarians are not anarchists nor are they archists; he preferred the term nonarchist. While the terms and labels have changed over time, the idea of self governance stayed the same. This was a highly enjoyable read. 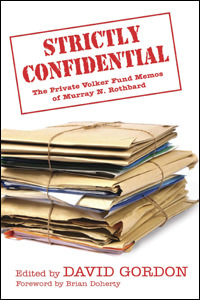 Strictly Confidential from Mises Media on Vimeo.